This collection of essays considers the evolution of American institutions and processes for forming and implementing US national security policy, and offers diverse policy prescriptions for reform to confront an evolving and uncertain security environment. Twelve renowned scholars and practitioners of US national security policy take up the question of whether the national security institutions we have are the ones we need to confront an uncertain future. Topics include a characterization of future threats to national security, organizational structure and leadership of national security bureaucracies, the role of the US Congress in national security policy making and oversight, and the importance of strategic planning within the national security enterprise. 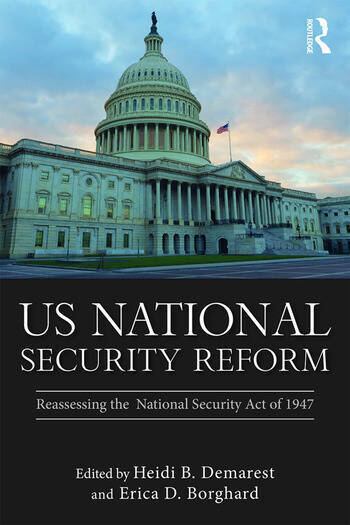 The book concludes with concrete recommendations for policy makers, most of which can be accomplished under the existing and enduring National Security Act. This book will be of much interest to students of US national security, US foreign policy, Cold War studies, public policy and Internationl Relations in general. 9. Security challenges in the post-unipolar era Andrew F. Krepinevich, Jr.
Heidi B. Demarest is an Officer in the US Army and Director of the American Politics program in the Department of Social Sciences at the US Military Academy. Erica D. Borghard is an International Affairs Fellow at the Council on Foreign Relations, placed at JPMorgan Chase and US Cyber Command.